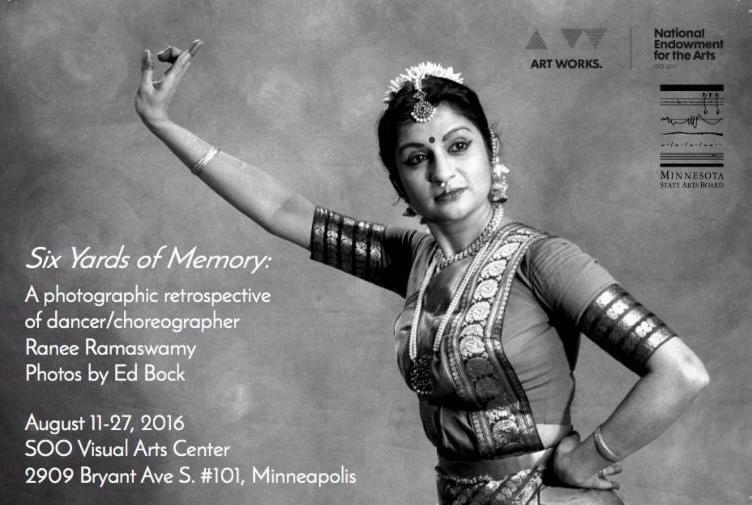 Since 1990, Ragamala's founder and Co-Artistic Director Ranee Ramaswamy has worked with photographer and artist Ed Bock on hundreds of dance and performance photos that have been seen nationally and internationally. These images have been on posters, flyers, in magazines and newspapers, tracing the evolution of Ranee's work and bringing it to the public eye. Six Yards of Memory is a retrospective photographic history of images taken over the last 25 years that reflect this unique artistic relationship. Featuring a collage of images printed on six yards of fabric, the exhibit weaves together Ranee's journey as a newcomer from India into an internationally renowned performer and choreographer. Ranee Ramaswamy is a fiscal year 2016 recipient of an Artist Initiative grant from the Minnesota State Arts Board. This activity is made possible by the voters of Minnesota through a grant from the Minnesota State Arts Board, thanks to a legislative appropriation by the Minnesota State Legislature; and by a grant from the National Endowment for the Arts. Copyright © 2016 Ed Bock Art, All rights reserved.